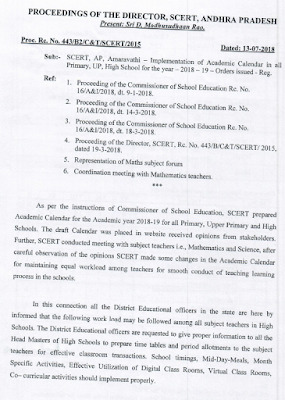 Sub:- SCERT, AP, Amaravati – Implementation of Academic Calendar in all Primary, UP, High School for the year 2018-19 – Orders Issued – Reg. 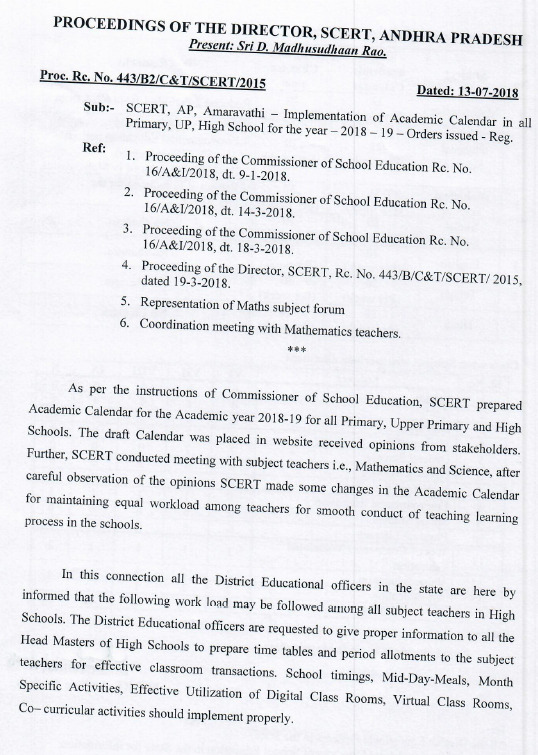 As per the instructions of Commissioner of School Education, SCERT prepared Academic Calendar for the Academic year 2018-19 for all Primary, Upper Primary and High Schools. The draft calendar was placed in website received opinions from stakeholders. Further, SCERT conducted meeting with subject teachers i.e., Mathematics and Science, after careful observation of the opinions SCERT made some changes in the Academic Calendar for maintaining equal workload among teachers for smooth conduct of teaching learning process in the schools. In this connection all the District Educational Officers in the state are hereby informed that the following work load may be followed among all subject teachers in High Schools. The District Educational Officers are requested to give proper information to all the Head Masters of High Schools to prepare time tables and period allotments to the subject teachers for effective classroom transactions. School timings, Mid-Day-Meals, Month Specific Activities, Effective Utilization of Digital Class Rooms, Virtual Class Rooms, Co-curricular activities should implement properly. 4 periods E.E. reduced for the class VI – X.